Phase-folded unbinned HATSouth light curves for HATS-50 (upper left), HATS-51 (upper right), HATS-52 (lower left) and HATS-53 (lower right). In each case we show two panels. The top panel shows the full light curve, while the bottom panel shows the light curve zoomed-in on the transit. The solid lines show the model fits to the light curves. The dark filled circles in the bottom panels show the light curves binned in phase with a bin size of 0.002. Credit: Henning et al. 2017. An international team of astronomers reports the discovery of four new 'hot Jupiter' extrasolar worlds by the HATSouth survey. The newly found exoplanets received designations HATS-50b through HATS-53b. The finding is presented in a paper published December 12 on arXiv.org. The Hungarian-made Automated Telescope Network-South (HATSouth) Exoplanet Survey is a network of 24 robotic wide-field telescopes. The telescopes are distributed over three locations in the southern hemisphere (Las Campanas Observatory in Chile, the H.E.S.S. site in Namibia, and Siding Spring Observatory in Australia). The primary goal of the HATSouth survey is to discover and characterize a large number of transiting extrasolar planets, reaching out to long periods and down to small planetary radii. To date, HATSouth has identified nearly 2,000 candidate transiting alien worlds of which more than 40 were confirmed as planets. Now, a group of researchers led by Thomas Henning of the Max Planck Institute for Astronomy in Heidelberg, Germany, reports the discovery of four new exoplanets, expanding the list of exoworlds found by HATSouth. 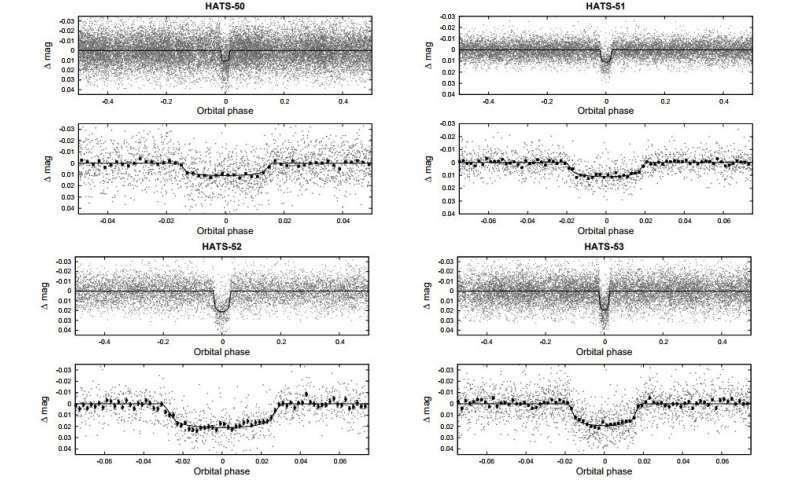 Using telescopes of the HATSouth network, Henning's team observed four G-type dwarf stars known as HATS-50, HATS-51, HATS-52 and HATS-53 between March 2010 and February 2016. They also detected transit signals in the light curves of these stars. The planetary nature of the newly found signals was confirmed through photometric follow-up observations and extensive radial velocity measurements. "We report the discovery of four close-in transiting exoplanets (HATS-50b through HATS-53b), discovered using the HATSouth three-continent network of homogeneous and automated telescopes," the researchers wrote in the paper. HATS-50b is the smallest and least massive alien world of all of the newly discovered exoplanets. It has a radius of about 1.13 Jupiter radii and a mass of approximately 0.39 Jupiter radii. The planet orbits its parent star every 3.83 days at a distance of about 0.05 AU from the host and has an equilibrium temperature of 1,348 K. The system is located some 2,300 light years away from the Earth. With a radius of approximately 1.41 Jupiter radii, HATS-51b is the largest exoworld among the four newly found extrasolar worlds. It is about 23 percent less massive than our solar system's biggest planet, and has an equilibrium temperature of 1,553 K. HATS-51b has an orbital period of 3.35 days, a semimajor axis of nearly 0.05 AU and is located about 1,560 light years away. In contrast to other exoplanets described in the paper, HATS-52b is a relatively very dense planet as with a radius of 1.38 Jupiter radii it is 2.24 times more massive than Jupiter. It has also a very short orbital period, given that it circles its star every 1.37 days at a distance of about 0.025 AU. The planet has an equilibrium temperature of 1,834 K and is located some 2,060 light years from the Earth. HATS-53b has the longest orbital period when compared to other planets detected by Henning's team – it takes it 3.85 days to fully circle its host, which is nearly 0.05 AU away. The exoplanet has a radius of 1.34 Jupiter radii, but it is about 40 percent less massive than Jupiter. HATS-53b has an equilibrium temperature of 1,312 K. The planetary system is located approximately 2,000 light years away from the Earth. The derived planetary parameters of the four alien worlds indicate that they all belong to the class of exoplanets known as 'hot Jupiters.' Objects of this type are similar in characteristics to Jupiter, with orbital periods of less than 10 days. They have high surface temperatures, as they orbit their parent stars very closely. We report the discovery of four close-in transiting exoplanets, HATS-50 through HATS-53, discovered using the HATSouth three-continent network of homogeneous and automated telescopes. These new exoplanets belong to the class of hot Jupiters and orbit G-type dwarf stars, with brightness in the range V=12.5-14.0 mag. While HATS-53 has many physical characteristics similar to the Sun, the other three stars appear to be metal rich, larger and more massive. Three of the new exoplanets, namely HATS-50, HATS-51 and HATS-53, have low density and similar orbital period. Instead, HATS-52 is more dense and has a shorter orbital period. It also receives an intensive radiation from its parent star and, consequently, presents a high equilibrium temperature. HATS-50 shows a marginal additional transit feature consistent with an ultra-short period hot super Neptune, which will be able to be confirmed with TESS photometry.